It happened again. I should have known better than to expose myself to online messages that can only lead to disappointment and distress. Tip – when you decide to take a mental break, I advise that you take a break from the internet, too. I follow the top hospitals on social media – MD Anderson, Mayo Clinic, MSK, among others. I like to know what’s going on when it comes to science and research, especially in relationship to breast cancer. As I was checking my Facebook page recently, a post from Mayo Clinic popped up. Reading the first sentence of this post felt like nails on chalkboard. The statement came from someone at Mayo. Based on the quote, at first I thought maybe he was a motivational speaker. But to my surprise I found out he was an oncologist. So, now we know: Attitude CREATES reality. Stop wagging your finger at me, Dr. Creagan! I know hospitals like to put out “inspirational messages” for their patients in order to encourage them, but I found those first three words so simplistic and perhaps even damaging that I could not get past them. I wonder, how is a stage 4 or terminal patient supposed to react when being told that changing their “attitude” will change their “reality”? Language matters, and medical professionals should be careful not to use words that sound misleading. Dr. Creagan’s statement is inaccurate and scientifically untrue. 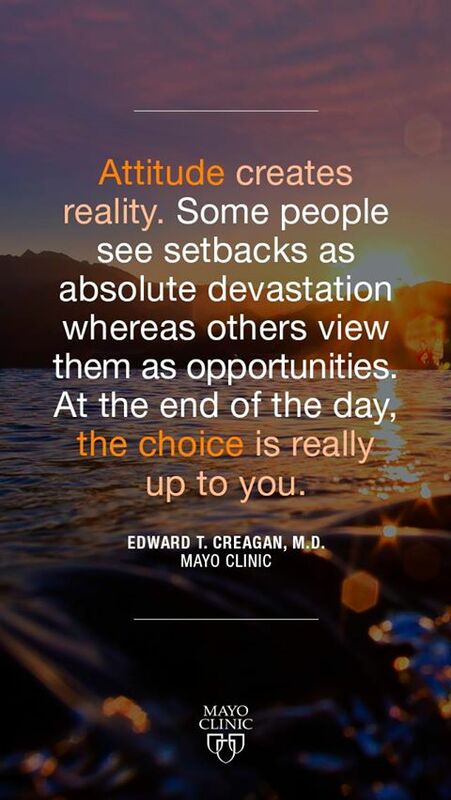 Attitude does NOT create reality. And if he really believes that, why did he choose to go into oncology? Please help me out here. Am I over-reacting? Perhaps my level of tolerance for the “positive thinking” approach has reached its lowest level. I am tired of these types of messages that only make patients feel more isolated. Patients don’t need that kind of pressure. What patients need is for their medical team to be truthful and supportive in addition to also saving their lives. Patients also need to be heard. A cancer diagnosis is a devastation, and patients should be allowed to see it that way. It isn’t always an opportunity for self-improvement or whatever else Dr. Creagan thinks the cancer experience should inspire. People look to respected medical organizations such as Mayo Clinic for sound, reality-based information. “Attitude creates reality” sounds like something from fantasyland. So, what I would say to Mayo is, you can either choose to contribute to the level of ignorance our society lives in or you can educate with facts, the choice is up to you. Just please don’t mislead people. Susan Rahn blogs at stickit2stage4.com and she was kind enough to let me share this powerful message. I am grateful for her advocacy. I’ve been dealing with all kinds of issues and emotions the last few months, which is one of the reasons I haven’t been very active on my blog. There has been too much occupying my attention — thinking about the many losses we’ve had due to metastatic breast cancer, examining my personal situations, and realizing that I still feel stuck in many ways. I’ll elaborate more on that in a separate post. This time I want to share something I can’t seem to let rest. After reading the message many times I thought maybe I should leave this one alone. After all, it represents a different perspective and the author is struggling with MBC. (I’m not in that position.) 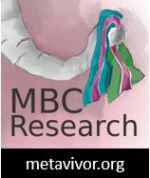 Do I dare involve myself in a metastatic community discussion? Perhaps the way the writer chooses to express herself is just none of my business. But, you know what? It is my business, because metastatic breast cancer is what has me and my loved ones feeling anxious since I stopped treatments. It’s what killed my friend last year and some of my family members … plus over 40,000 people yearly (in the U.S. alone). So, I find myself writing a critical response to an article written by a stage 4 patient. I think she is missing some important points. The writer of the article feels marginalized personally by the fighting mentality of the aggressive advocates, and feels that she has no place in the mets community because she chooses not to express rage. I agree that many patients do feel alone in a community where many of the responses among patients are not compatible. And to be realistic, there will always be differences in our approaches and attitudes to survivorship and being forced to live in this world. I’ve come to accept that to some extent there will always be divisions, even when we all have a common goal. But, one approach may take us longer to reach that ultimate goal — that is, no more suffering for any one — than the other. And that is what I want to emphasize here. To the writer of this article: I am sorry you are dealing with MBC and that you have lost so many loved ones due to cancer. I am sorry you feel alone and in fear of being yourself in a community where you thought you would meet others with the same attitude as yours. On the other hand, I don’t believe the intentions of these patients you call bullies are to exclude patients like you from the metastatic community. I don’t believe their anger and frustrations are directed at you, but instead at our current system and culture. These advocates feel a deep need to aggressively confront the threat of cancer and the lack of real progress. They are outraged and rightly so. They are also passionate people who are seeking solutions and answers. They feel helpless and the only thing left to do is get loud, because they feel unheard. The types of changes we’re looking for don’t come from just being quiet or thinking/acting positive. I’m not saying the quiet and reserved approach is wrong as a way to make survivorship and quality-of-life better. Each patient handles their situation their own way. And these patients — the ones perceived as angry people — also try very hard to live their lives, and they are surely grateful in their own way for what they do still have. Behind those “angry” faces and loud voices there are patients who are petrified and eager to live. I believe they’ve run out of patience. Their personalities are not the type that allows them to sit and watch, like most of us probably do. And for that, we should all feel grateful. These people are passionate about saving not only their lives, but ours too — and this is the part that frequently goes un-noticed. These people who want to have a fistfight with the status quo are fighting for every one of us. And thank goodness these passionate people exist! We are dealing with an URGENT matter. Please let’s allow them to help us. They might not sound polite enough for your taste, but at the end of the day, all they want is for us all not to live in fear anymore and for us to live longer lives. And I don’t think their intention is to marginalize or cast aside the people in the mets community who want to take a kinder, gentler approach to survivorship. Instead, they want to cast aside an approach or point of view that doesn’t help empower their own sense of what it will take to solve the problems. So, I guess one way to look at it is that the approach to survivorship that the writer wants to live by — with gratitude and grace — can be viewed as a complete different situation than the one the loud people are engaged in — trying to effect society. There’s a place for both gratitude and outrage in all of us. What these patients are fighting so loudly for is much bigger than the survivorship part of the situation. 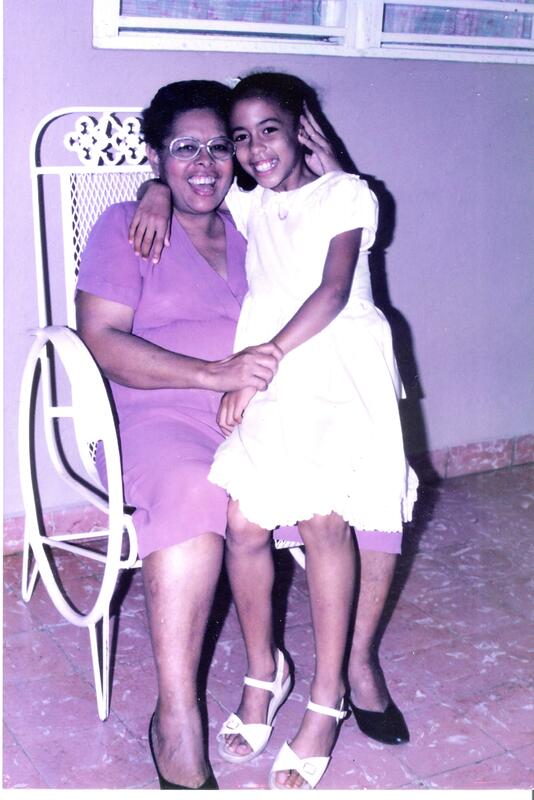 Mother’s Day is approaching, and as usual I’m thinking of my grandma/mama, who raised me — wishing she was here. As some of you know, I’ve been writing memoirs about my childhood, and my grandma is always an important part of them. This Mother’s Day, I’ve decided to take a risk and share one of the short stories, which I titled “You Won’t Forget, Right?” It captures the relationship my mama and I had, which I’ll always cherish. This story is based on true events and it represents one of the many ways she showed her love for me. I watch my friend Nelly’s little granddaughter, Rebeca. She is lying on the floor next to the radio, listening through the static. It is 2 PM and time for the daily announcements. When Chopin’s “Funeral March” plays, the host announces the deceased, and Rebeca writes down the names. She calls to her grandmother. “Why? Did she die?” Nelly responds. “Yes she did! They said she lived in Los Batelles,” Rebeca says, coming to the kitchen. Nelly pauses. “Hmmm. I don’t think I know anyone with that name.” She calls to her husband. “No.” Sigfredo says abruptly, never removing his eyes from the baseball game on the TV. Rebeca looks disappointed. Then, seconds later, Nelly remembers. “I guess I can come with you,” I say to Nelly. “Does this mean you’re going, mama?! The funeral is at the Funeraria el Angel,” Rebeca reads from her piece of paper. “And mama, you won’t forget, right?” Rebeca turns to me, and says, “Alba, you won’t let her forget. The funeral is the next morning, and I return to the house to pick up Nelly. Rebeca and Sigfredo are helping her into her girdle. “Bonito Sigfredo!! You’re holding it the wrong way, use both hands! And you, Rebeca, hold the zipper together and try not to let go. Now push!” Nelly says. I join them, and we finally fit Nelly into her girdle and purple funeral dress. “It all depends on how crowded the room is,” Nelly says. Rebeca watches us as we walk out the door. It is a nice summer day. Except for cyclone season, it’s always a nice summer day in the Dominican Republic. “Yes, I already promised Rebeca,” she says. We arrive at the funeraria and Nelly immediately spots a seat close to the snack table. There are small sandwiches, panca mints, Country Club soda, and coffee. And the soda crackers with the Swiss cheese and mayonnaise. Nelly is examining the table and watching the room when Josefina’s husband approaches us. I hug him. “Señor, I am sorry to hear about Cheeks,” says Nelly. I nudge Nelly. “Her name is Josefina. Say Josefina,” I whisper. “Fine, but most people called her ‘Cheeks’,” Nelly protests as we approach the coffin to say our prayer. Nelly looks back at her chair close to the snack table. More people are gathering with their rosaries. Most of the chairs have now been taken. As we pray, an older man places his hand on the chair Nelly has been watching. She immediately gives up the rosary and rushes toward him. “Señor, my feet have blisters. I walked a mile to see dear Josefina. May I take that seat please?” The old man surrenders and moves along. Nelly sits and waits for me to join her. She looks around nervously. “Alba, is it me or are there more people here than there are snacks?” Nelly asks. Later that afternoon, we return to Nelly’s house. Rebeca has been waiting on the sofa. She is wearing her holiday white dress and best shoes. She jumps up. “How was the funeral, mama? How many people showed up?” Rebeca asks, pulling at her fingers, gazing at her grandmother. Nelly reaches into her handbag and brings out an item wrapped in white tissue. She hands it to Rebeca. Rebeca takes these treasures to the backyard and sits under the mango tree. She carefully unwraps Nelly’s present. It is the special cracker with the cheese and mayonnaise spread. “We usually have those only on the holidays,” Nelly tells me. We watch Rebeca enjoying her treat. She is looking at Josefina’s mass card. This story © 2016 Rebeca Matos | All rights reserved. To all moms: Have a wonderful and happy Mother’s Day. You’d think I’d be used to it by now. That I wouldn’t feel a need to write about it after all this time. But this isn’t the case. And I am not too sure it’s any other survivor’s case either. Once you’ve been diagnosed with breast cancer, getting mammograms become an anxiety-inducing event. It doesn’t matter how many “clear” results you’ve received post-diagnosis. You start to worry days before your scheduled appointment. For me, it’s more than just the fear of experiencing a cancer recurrence. Approaching every mammogram at my hospital feels like preparing for “Judgment Day.” First, I schedule my mammograms for a time when I think they won’t interfere with me psychologically. Some patients want to postpone this test until after they’ve had their vacation or celebrations. Me? I want to get a “clear” prior to even trying to enjoy myself, otherwise, I spend my whole holiday stressing about it. At least I have some control over the timing. But once I show up to my appt, I no longer can control anything. It’s the way this procedure is conducted at my hospital that distresses me. There are several mammogram technicians who frequently come out to call on different patients. Once I hear my name being called, my heart beat accelerates, as I am aware of what they’ll be looking for and what I don’t want them to find. I go into the mammogram room with the technician and get asked questions about symptoms and family cancer history. All over again. I’m then asked to remove the gown to start the “pancake” procedure. My breasts get flatten by the compressor plate which allows for accurate imagery. Several pictures are taken. I start to wonder if all this radiation is activating the bad cells, which can happen due to my ATM gene. It is a very uncomfortable test. But to me this isn’t the worst part. The worst part is the wait and how each group of women is kept in a waiting room, then moved to another room, and then moved to another room, depending on what the doctors see. It feels as if we’re waiting for a verdict, except there is no one to defend us. And if we are lucky, we get to go free that same day. After I am done with the mammogram, I’m asked to go to a room where all the patients anxiously wait to hear their verdict. This is the time when I exceed the number of texts on my phone plan and sit restlessly. Often, a TV is on, broadcasting bad news about the world, making the aggravating atmosphere even worse. I eventually hear nurses call each patient to inform them about their results. After the interaction between the nurse and the patient, you either see the patient leave or go into yet another room for a different type of scan. This usually means they’ve found “something” suspicious and they need to further investigate. And this is the worst part for me. Seeing how the patient, very slowly and with a look of concern, follows the nurse to the other room. Despite their fears, they proceed anyway. It is devastating to just watch. I also can’t help but think I might be next. After all, although we’ve been through our treatments, we’re never really done. We are not cured. Finally I hear my name called. I follow the nurse who conveniently stands between the exit door and the sonogram rooms – where patients need to go after something suspicious is found. I get clear results (at least, I have so far). I am handed the paper stating those results and my recommended next appointment date. I take a deep breath and thank the nurse for delivering the good news. I immediately head into the bathroom. I stare at myself in the mirror for some time, still in disbelief of why I am there in the first place. I think about the other patients. I always do. Especially, I think about those who have passed from my family. From my support circle. I cry and I feel both grateful and guilty for getting another “free pass”. I get dressed and go back into the world where I am expected to act as if I am completely done and shouldn’t worry anymore. But I still worry. And despite my fears, I continue to live my life anyway. Until the next verdict. At first, the most annoying thing about radiation was having to be at my hospital everyday for 21 consecutive days. The burns caused by the radiation were not pleasant, but skin heals. I have to say though that, emotionally, radiation was worse for me than chemo. I did not cry during my chemo infusions, but I did during radiation treatments. I am not sure if it was related to the fact that I was coming closer to the end of my treatments, and I was just then realizing what I had gone through the previous six months. During the beginning of my cancer mess, I was in a I-have-to-take-care-of-business mode. So there was hardly any time for me to really absorb what was happening to me. Everything moved so quickly and slowly at the same time. Because I was told that radiation would be the “easiest” part of my treatments, I did not ask anyone I knew to come with me. Each daily appointment was no longer than 30-45 minutes anyway, including the wait. I thought I could handle it juuust fine. I had already gotten my “simulation” done days before starting my radiation treatments. The radiation team had precisely identified the area on my body that would be radiated. My body was positioned carefully, face down. And I had to remain still. The radiologist put marks — permanent tattoos (dots) — on the breast and surrounding areas to target the treatments. These steps weren’t too bad. Then, I was brought into a room to take photos of my breasts. They also took a picture of my face. I don’t know why they did that. Maybe for identification. In the photo I looked like I was being charged with a crime I did not commit. I found that moment to be quite unpleasant and I wanted it to end as quickly as possible. I entered the cold room and removed my robe. I positioned myself face down on this really hard and narrow table. I was asked not to move, and eventually was left on my own listening to this melancholy music they played. To the side of me were several brain radiation masks (once you’ve seen one of these, you’ll never forget it). Suddenly, the robotic machine started moving around me. Several people watched me from behind the glass. The invisible laser was hitting different areas of my breast and surrounding areas. I didn’t feel a thing but watching this machine move around me, from one side to the other, made me feel invaded. I also felt isolated. At that moment, I wanted to run away and never come back, but then I remembered I could never run away from cancer. I also remember trying to hold back my tears, and many times I was unsuccessful. Something about that machine shooting an invisible laser, and me not being able to move while being watched by an entire hospital staff staring coldly from behind a window that made me feel subjugated. 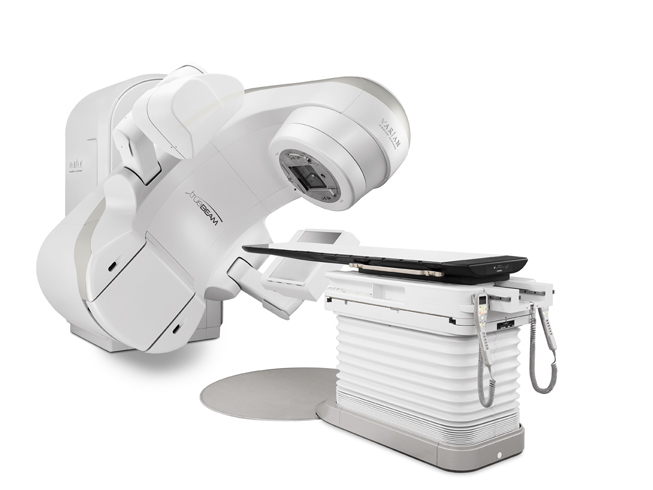 After each treatment, I would walk out of the room and see the radiologists performing treatments on other patients. At times it was hard to ignore their computer screens, where different parts of peoples’ bodies were exposed. There were just too many. I felt a sense of guilt, knowing that some of those people probably were worse off than I. It was a very sad scene. But it wasn’t my choice to be there. And there was something else: on my way out of the office, I would encounter kids sometimes. There I was thinking I was too young to be dealing with cancer (32 years old), and then a child would put things into perspective for me. Of course, there’s no right age to face cancer, but it’s just wrong seeing a child go through this awful experience. They should be playing games. Not doing this. Towards the end of my radiation treatments, I felt extremely tired, both physically and emotionally. The overwhelming stress I had dealt with for several months was finally catching up with me. Over the course of this whole thing, each treatment — the surgery, the chemo, the Tamoxifen — has had a different effect on me psychologically, but the radiation days haunt me most. Radiation was a reinforcement of the loss of control I felt – the ‘scientist’ behind the glass, not being able to physically move while being treated, the burns on my skin, and the burns on top of the burns. I could not avoid those 21 consecutive days in order to get the best outcome possible. And everything was against my impulse. It was over five years ago that I completed my radiation treatments. I still experience pains on the radiated area, which is also a reminder of what I went through. This is part of the collateral damage we deal with, even after surviving a traumatic event such as cancer. Although I am done with those treatments, I still feel like it isn’t over. 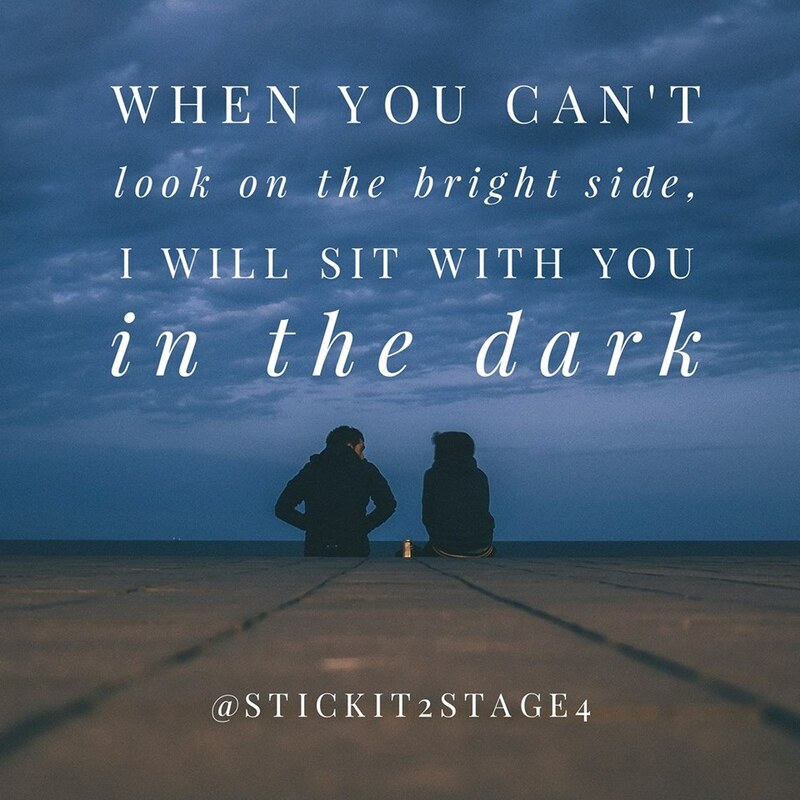 Survivorship is difficult, especially when dark memories haunt us. 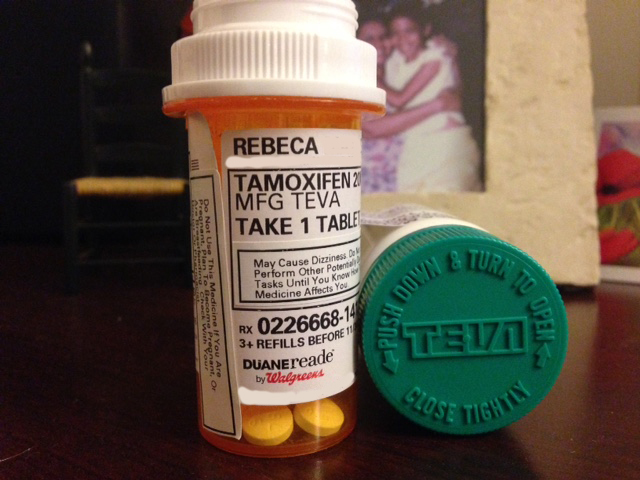 Last year, I shared the story of how I was given a different brand of my Tamoxifen at the pharmacy. It was made by Mylan instead of Teva, the brand that I’ve been in a long relationship with (click here to read the story). I felt confused. At the time, I hadn’t realized there were different brands, and I soon learned that patients could experience different side effects from each of these brands due to the fillers each manufacture uses. (The active ingredients are supposed to be the same though.) Patients can try different brands to see which has the least side effects for them. This month, I’m learning from online support groups that many Teva patients are experiencing the same situation — their pharmacists are recommending different brands other than Teva. But each patient is being told a different story – either that the Teva product is being discontinued, that there’s a shortage, etc. What’s going on? I’ve been taking the Teva brand for years now, and although I complain about this medication a lot, I am really not doing too badly on it. My uterus is still healthy (knock on wood!) and I don’t experience hot flashes – two biggies for me. The thought of trying a different brand concerns me. I want to stick with the devil I know. I once did give the Mylan brand a try for a few weeks, and I experienced dizziness and loss of balance, to the point where I thought I was having brain mets! This side effect was scary. I demanded my Teva back, and the pharmacy eventually ordered it for me. I felt a huge sense of relief, and suddenly the side effects that Teva did have on me were more acceptable. This month I had another worrying interaction with the pharmacist. She stated that the Teva brand had been discontinued by the manufacture, and that my only option would be to go with the Mylan brand. I explained the symptoms I had experienced with Mylan, but the pharmacist pretty much ignored my concerns and suggested I take it anyway. I refused, and left the place. I went online and did some research, hoping that the 8 Teva pills I had left would allow me enough time to find what I wanted. I learned that, apparently, Teva was acquired by a company called MaynePharma, so I reached out to them directly. The friendly representative I spoke to confirmed that they bought the Teva brand, and the good news is that the fillers are exactly the same – same exact drug and manufacture process. I was given the National Drug Code (NDC) for the 30-day supply (#51862-446-30), and I was instructed to provide this code to the pharmacy so they could place the order for me. MaynePharma even suggested that my pharmacy give them a call, if they experience any issues with the order. I returned to the pharmacy, hoping to get better luck this time. The pharmacist looked up the NDC # and stated that the drugs would not be available until late March, and that there seem to be a shortage across the board for all the different brands of Tamoxifen. She also refused to contact MaynePharma. I tried other pharmacies, including the one at my hospital. They all offered me the Mylan or Watson brand. No Teva. Eventually, I found a pharmacy that would work with me. The pharmacist I spoke to was very empathetic when he heard the struggle in my voice on the phone, as I tried to explain my fear about taking the Mylan (or Watson) brand. The pharmacist said he would try to order it for me. And I am happy to report that I was able to get my Teva brand after all — just a few days later. An experience like this adds to the difficulties of survivorship for patients like me. Some pharmacists do not realize how we develop a relationship with the drugs we are dependent upon for our lives. After going through a traumatic event, such as cancer, we desperately seek some level of normalcy or consistency. And this is so hard to accomplish, especially when we have no choice but to work within the pharmaceutical system. I don’t like changes forced on me, especially when those changes would make my life more complicated than it already is. Yes, we have no choice but to take the treatments that are available to us, but it would be helpful if we could be allowed to gain some small level of control back after losing so much— even if it’s as simple as not having to jump through hoops to find and keep the drug we want and need. A side note: I’d like to encourage everyone to ask their Oncologist what they’ve heard about the Teva acquisition. Was there a reason it was “taken off the market” in some areas? And please come back and share in the comments section. I took some extra time off from work during the holidays to recharge. 2016 was a very tough year all around. I was looking forward to doing fun things to distract myself and see some friends I haven’t seen in months. I really planned to end the year in a better mood, but instead I got sick with a terrible cold. So I stayed home and tried to rest, something else I haven’t done in a while. I thought catching up on movies would be a fun thing to do. Among the movies was an Australian-Canadian psychological horror film I’ve been wanting to watch, The Babadook. The Babadook is about a woman who loses her husband in a car accident as they drive to the hospital, where she delivers her baby that same day. She raises the child on her own while dealing with grief, all the time becoming more and more threatened by a monster from her child’s picture book. I interpreted the movie’s Babadook monster as a physical representation of the woman’s unresolved emotional states of grief and denial. Both emotions affected her relationships and eventually took over her home and sanity. It took the woman years to start creating some meaning and to bring back some normalcy into their lives. In the end, the woman’s Babadook wasn’t completely gone. She kept “it” in the cellar where she would visit it from time to time. She did not allow her child to be exposed to her pain anymore, but rather learned to live with it, keeping it separate. In the movie, I saw how the woman was being treated by friends and family while she was deep in her long-term pain. Her sister, who appeared to be her only family, didn’t want to deal with the heaviness and would often avoid her or challenge her. “It has been seven years! !” she yelled at her widowed sister one afternoon. This lack of empathy bothered me because I can relate to it. It reminded me of the times I’ve been asked to move on from my grief or from cancer. I also saw myself in the grieving woman, and it made me reflect on whether or not I’ve allowed myself to sink in my own darkness, and how long I’ve been there. I believe in allowing ourselves to go through all the emotions any given situation provokes. And when the situation is painful, we decide how long the healing takes. I don’t think someone else should be telling us that we are taking too long with our grief. It’s personal. I’m not discounting our families’ or friends’ desire to see us move past cancer. I know they can feel scared for me and helpless to know what to do about it. Of course they want me to move past it. I wish the same. But, in my case, cancer is my Babadook, one that I manage to keep in my “cellar.” I deal with it the best I can. I can’t completely walk away from it because I’ve considered it to be part of who I am. And yes, it has defined me in many ways. It has pushed me to make some sacrifices too. I’ve needed to distant myself from some relationships in order to allow myself to just be, while allowing others to take a break from my reality. Because yes, it can be overwhelming and painful for others who haven’t been in the same situation we have. 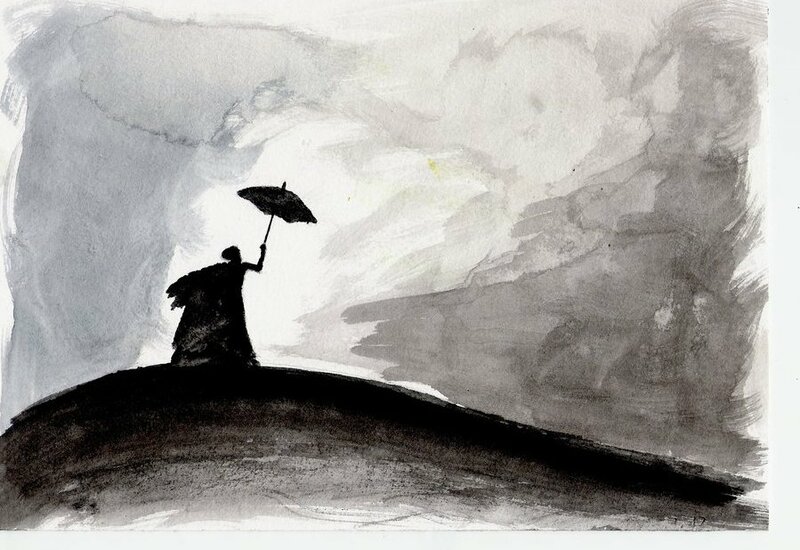 In the movie, I appreciated how the writer used the last scene – when the woman visits the Babadook, now locked in the dark cellar – as a metaphor. And this is the message I took with me. The scene acknowledged that it is important to recognize and deal with our oppressive emotions. And that it is even therapeutic and meaningful to keep those fears and emotions alive, to allow us to keep up our awareness and be vigilant over the problem. It is an ongoing effort to ultimately reach a level of inner peace and create that sense of balance we all crave. I find that the culture at my cancer hospital is too formal. And sometimes I need a hug or two. Maybe I am asking for too much. I recall my first visit. I first met with my surgeon, who was distant and to the point. He immediately did a breast exam and proceeded to tell me what the treatment plan would be for me. I started to shake, sitting across from him. He felt bad and held my hands, “this is serious but we’re going to treat you to get the best outcome possible, don’t worry,” he said. My surgeon was very kind to me. He was also very competent. I remember him asking the nurse to contact a counselor so I’d have someone to talk to. That counselor came to meet me right away after I was done with my consultation. Then, for my first oncology visit, I initially met with a medical resident. I thought that was odd, considering it was my first time meeting with my oncologist for such an important appointment. At the same time, this also gave me the impression that perhaps my case was not too serious. However, the resident was a bit too dramatic for me. She took long pauses between words as she drew little images of cells on a piece of paper, “so…this is…your…cell…and this is…your cancer…” She was showing me the survival rates if I opted to take chemo, Tamoxifen and radiation as my treatment regimens. She then proceeded to show me how Tamoxifen binds with the receptors so cells won’t feed from the estrogen – all done through her amateurish drawings. I already knew I was taking all the necessary treatments for my cancer. And where was my oncologist? Eventually, my oncologist came into the room. From the start, Dr. O was very formal and by the book. She immediately spoke about research and statistics and explained how treatments were going to benefit my case. And I was just sitting there with my head tilted, staring at her, without really understanding what those research numbers meant for my situation. And at that point I did not care. I had already focused on the 86% 5-year survival rate the resident had given me if I took all possible treatments. I couldn’t deal with anything else at that moment. Dr. O. was very competent but I got no hugs on my first consultation. After several visits, I decided I would try to get my oncologist to be more affectionate with me, even if this was risky for her. I started by giving Dr. O a hug at the end of each consultation. Then, eventually, I started welcoming her with open arms as she entered the room, “Dr. O, so good to see you!” and she would reciprocate. Now she’ll playfully say things like, “Where is she? Where is she?! There she is!” as she enters the examination room. And yes, we hug, always. It feels good. Now the experience feels more human to me. I feel less tense and less afraid. I continue to see my radiation doctor. Everything about this experience has been very “robotic” and emotionally draining— more so than chemo. It has been hard for me to get close to Dr. R. She is very serious and just takes care of business. I’ve tried getting her to be more warm after all these years, and sometimes I’ve managed to make her laugh with my jokes. Who would have thought I could joke in an oncology room? But there is one thing I appreciate about her. She is very flexible with my care, which is why I enjoy seeing her once a year. I’ve told her about my desire to build a family, and out of all the doctors I’ve seen she has encouraged me the most. Dr. R feels very confident about my situation and always encourages me to have quality of life, even if it means I stop taking Tamoxifen. Next time I see her, I am going to hug Dr. R, whether she is emotionally ready or not. I guess you can say I have a good balance among all my oncology doctors. They all contribute to my physical and emotional care, one way or another. I am truly grateful for every one of them. I can’t completely disregard the feelings of these oncology doctors. I am sure there’s a reason why my cancer hospital is so formal. What happens there is very serious. These doctors lose patients all the time. It must be tough for them too, which is why they don’t personally get too close to their patients. I still don’t know how they do it, but their jobs are very important and necessary. They also need to be kind to themselves in order to keep performing their responsibilities. But I must tell you, a hug can make a big difference in a patient’s care. Maybe I am asking for too much. 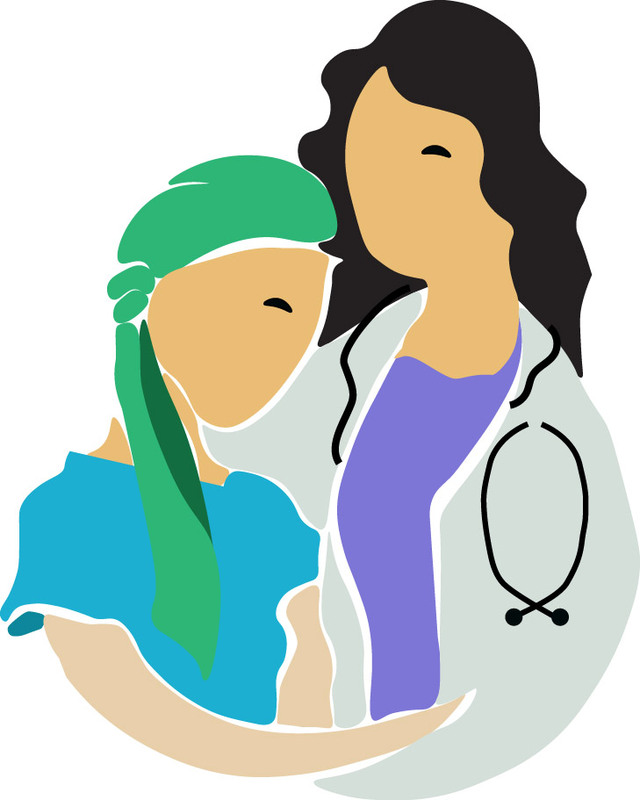 How would you describe your relationship with your Oncologist(s)?